People who manage nonprofit organizations understand just how difficult it can be to make ends meet – especially in a tough economy where fewer people are donating. When every dime goes to spreading your green message, it can be difficult to find a spare $2,000 to $5,000 for a website. The good news is, with WordPress, you can now create and manage your website without spending thousands of dollars for a web developer. In fact, your new website may only cost your time! The most important thing to consider when selecting a WordPress theme for a nonprofit is layout. You want your visitor to understand what your nonprofit does in one glance. You will need dedicated real estate to showcase your mission statement, key programs & services, and most importantly have a donation box front and center. Finding a WordPress theme with this layout takes some research, looking through curated lists, like this list of awesome green WordPress themes, or surfing through numerous WordPress theme directories. Finding the right theme for your nonprofit might seem like looking for a needle in a haystack. The good news is, we’ve identified some great WordPress CMS themes that work well with nonprofit organizations, as well as some great WordPress blog themes, for project specific blogging. 1Green Stimulus is a free WordPress theme with an animated content slider, customizable social media icons and the ability to embed videos. 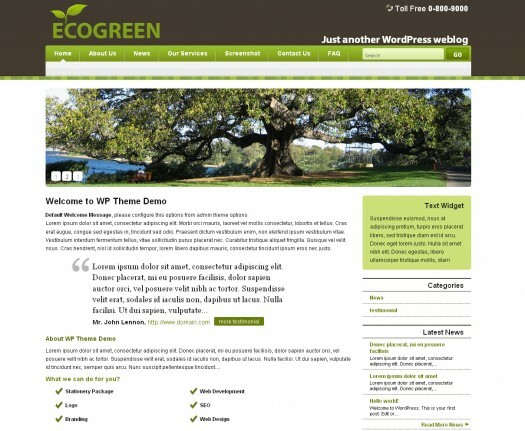 Green Stimulus is a great option for a sustainability nonprofit, or any nonprofit organization, especially since it was the only free WordPress CMS template we could find. The nice thing about Green Stimulus is its versatility. You can use the theme as standalone nonprofit website CMS (content management system), with or without a blog. You can also choose to have blog entries published to your website home page – a steady stream of fresh content is good for search engine optimization. You can also completely customize the CSS so that the theme reflects the look and feel of your brand. To see how easy this theme is to install, watch this video demo of a San Francisco cause marketing agency using Green Stimulus. 2Charity Organization template is a gorgeous WordPress CMS theme that includes six call-to-action areas where you can highlight campaigns and solicit involvement, all on the home page. Blog posts appear below the main campaign focus areas. At $55, this beautiful theme is a great value. 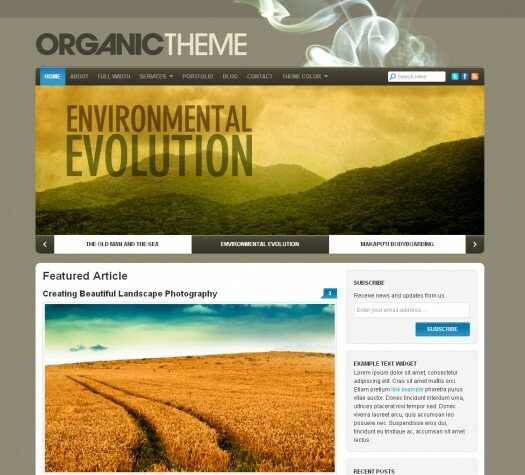 3Organic’s Nonprofit Theme is an attractive $69 theme that includes custom tables and a lot of space for information on your home page. This design will make an impression on volunteers and donors alike. The well thought out layout allows you to feature the most important information about your organization, such as your mission statement, contact information, programs, newsletter sign-up and donation widget. 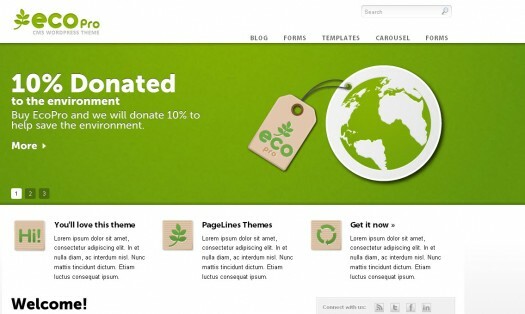 4Agency Theme is a nonprofit WordPress theme by Organized Themes. 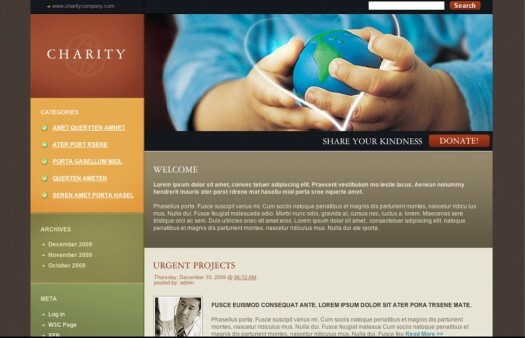 Designed with nonprofits in mind, Agency Theme is also a great template for religious charitable organizations. It comes with a featured content slider and prominent donation button on the home page, which can be easily removed. 5You have a choice between Earth and Ocean with the Organic’s Nonprofit Theme. From the earthy colors to the customizable portfolio, you will find this website theme has everything your nonprofit needs. Your $65 fee even includes a separate blog! 6Down to Earth is another theme that showcases earthy colors. You can use the content slider and two-level navigation to present a clean website to your volunteers and donors. The Down to Earth theme costs just $27. 7Coffee Break offers you the chance to customize your home page and posts. These posts can include a slideshow from a recent volunteer event or mini features about important donors. Your $70 fee includes 17 styles and various customizable widgets. 8Your visitors will be impressed with this theme because 10% of your $79 fee goes straight to supporting the environment. This clean theme includes five color options, a content slider and customizable widgets to make your nonprofit organization really stand out. 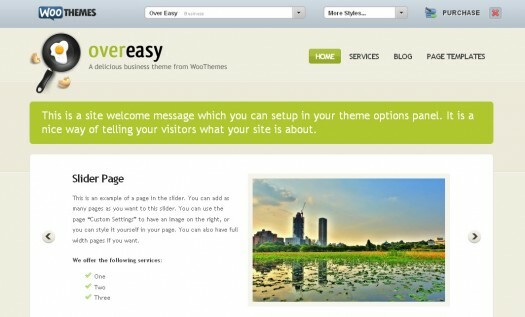 9The Over Easy theme features a content slider page that gives you more room to tell the world about your organization. You can choose from seven color schemes, a variety of different home page templates and five customizable widgets – all for just $70! 10The Charity WordPress theme is a professional clean cut blog theme in warm colors. There is a dedication section on the home page for your mission statement or project overview, below which your blog posts will appear. At $55 it’s an attractive, easy WordPress blog template to document specific projects and campaigns. If you are a nonprofit using WordPress and also have received free Salesforce CRM licenses for donor management, another useful thing to know is that you can use the WordPress-to-Lead plug-in to capture donor leads from your WordPress site. WordPress is a terrific web publishing solution for frugal nonprofits. If I’ve missed any great nonprofit WordPress themes, feel free to add them in your comments.Lorna Li is an online marketing consultant who writes about home solar and green business. Follow her on Twitter at @lornali. These are good choices. I've used Organic's Nonprofit theme and can vouch for it being well coded and easy to modify (it includes instructions on how to add a jquery slider). Almost any WordPress theme might be suitable for a particular nonprofit's needs. An environmental campaigning organisation would want to present a very different image than an organisation involved in domestic violence support, community housing or arts. Fortunately the prices of premium WordPress themes are easily within the reach of small charities, especially compared to the cost of design from scratch. Quality tends to be good too – I've bought themes from StudioPress, Woothemes and Organic and been impressed. I wouldn't recommend using many of the free themes, even thought they can seem like a tempting option. Great list and thanks for including Agency in the list. Organized Themes has a new non-profit focused theme called Foundation you might like as well http://www.organizedthemes.com/foundation-theme/. Yes Bill i’m also agree with you .. It was rather interesting for me to read the post. Thank you for it. I like such topics and anything that is connected to this matter. I would like to read more soon. It is rather interesting for me to read the post. Thanx for it. I like such topics and anything that is connected to them. I would like to read a bit more on that blog soon. There are hundreds (or thousands?) of free themes that WordPress offers, and I believe it’s easy to cruise their nonprofit themes section. For more advanced themes, paying an independent developer 40 or 50 bucks doesn’t seem excessive. Have you actually tried these? We bought the Community Organization theme after reading your review and it has been a nightmare and essentially our org just lost $60. None of the images or logos or things are customizable. I really do NOT recommend it, despite how gorgeous it is. Sorry to hear that, Erika. No, we haven’t used the Community Organization theme. (We’re using variations of the Awake theme for many of our clients.) We don’t have a paid staff so rely on feedback from the community — like yours — to help inform nonprofits looking for a nonprofit theme. Again, many thanks! i can do d same for you if you need it, contact me to know more..
why don’t you make a child theme for it? Why don’t you have support of step by step instructions on how to configure any of these themes? I’m pretty web savvy but still have to weed through a lot of code, trial and error just to figure it out. It’s wasting a lot of time. Has anyone used the Charity organization theme? Any issues with implementation? Does it have good commenting support? Is down to earth theme still available? I like the charity organization template,try to provide some more templates like that and the theme stimulus is excellent. I love how these themes, directed at non-profits, can cost substantially more than some really impressive and gorgeous themes from say, ThemeForest. ? I can’t download. Can you share me? it is not a crime to charge a non-profit for work done. Embezzling a non-profit or any other entity is shameful. Non-profits DO get income and pays it’s employees accordingly. If it was a volunteer organization, then THAT is another deal. Even Pay-Pal charges non-profits! you want free? Get over it! SSE was founded to assist startups in all internet-related services. Visit http://www.savitur.co.in for internet-related needs. This theme is great for nonprofits. 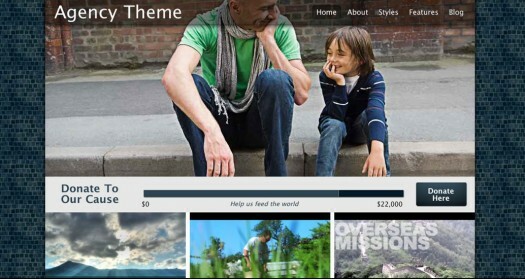 Those are some great looking themes for non profit organizations.